Poinsettias in red and white set the tone for Christmas and stay in bloom till the Easter lilies join in bloom. These lovely shrubs grow very well in pots and prefer less watering. After Easter in March, pruning the poinsettia down to about 1 foot to the ground, prepares for their winter flowering in November. The branches that have been cut off can make new plants of their own! 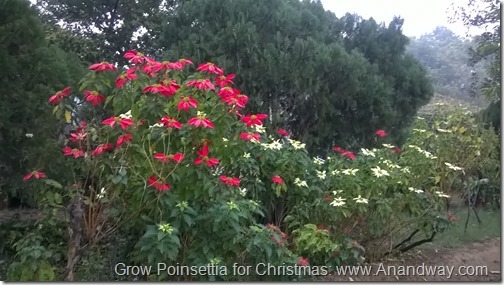 Take the branch cuttings of poinsettia, remove the leaves and the softer branches and cut them to about 8 inches in height. A single piece of 8 inches when nurtured in a pot yields a lovely plant in a month’s time. It survives the summer to bloom in winter. It is rewarding to see bees and sunbirds hover on dew drenched poinsettias.